In a daring move, Dario Argento brings all his Giallo schooling and sets them loose in a fairytale horror story with a colour scheme inspired by Disney’s Snow White and the Seven Dwarves in one of the most beloved genre pieces to come out of Italy. Suzy Banyon, Jessica Harper, has just arrived in Germany to study Ballet at the Friedberg Tanzakademie. Outside in the cold rain she halts a taxi to take her to her destination – driven by Fulvio Mingozzi. As she arrives at the school, the initial murder takes place and one of Argento’s most spectacular murder set pieces is unleashed on the audience as Eva Axén takes one in the heart for art. Suzy’s new friend Sara, Stefania Casini, starts telling her a thing or two about the strange activities at school. When Sara goes missing too, Suzy takes up her own investigation which leads her straight into the coven of Mater Susperiorum as Giallo and supernatural horror come into perfect harmony. 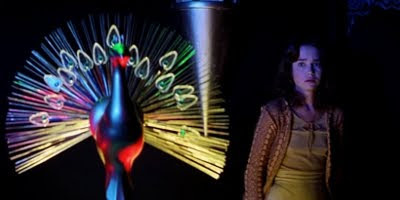 Exhibiting some superb cinematography, a fantastic script by Argento and Daria Nicolodi, an innovative and haunting score by Goblin and a supporting actors like Alida Valli not to forget that tiny part by Udo Kier, Suspiria undoubtedly results in one of the best Italian horror movies of all time. An important and influential movie, which thirty years later still is one of the most beautiful and impressive pieces of genre filmmaking of all time.